Test benches can be incredibly convenient for those that frequently find themselves swapping hardware but they’re a bit of a double-edged sword. While their open-air nature makes it easy to access components, the fact that hardware is exposed can be concerning for those with small children or curious pets. What’s more, at least for those in the industry that implement temperature readings into their hardware reviews, open-air rigs exhibit different cooling behavior compared to a sealed system. It’s with these factors in mind that Lian Li created the PC-T70 test bench. The PC-T70 is different from your ordinary test bench in that it can be fitted with an optional cover and panel kit designed to simulate a closed-air environment. The kit includes side panels that can each accommodate two 120mm or 140mm fans (or radiators) complete with removable mesh dust filters, a rear panel with 120mm / 140mm exhaust fan mount and a magnetically-attached acrylic canopy to cover the motherboard compartment. In addition to offering protection for exposed hardware, usage of the kit could lead to less “misguided” temperature results that are more consistent with what the average reader might experience at home in a traditional closed-air chassis. 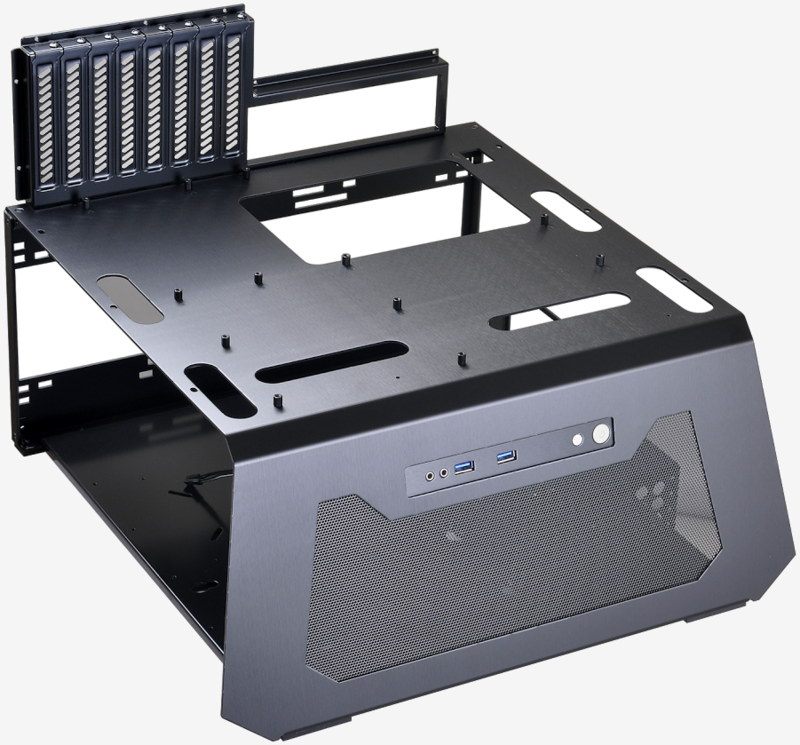 The test bench can support E-ATX, ATX, Micro ATX and mini ITX motherboards with room for eight expansion slots and video cards measuring up to 330mm in length. The bottom shelf can hold ATX PSUs up to 330mm in length as well as five 2.5-inch drives and one 3.5-inch drive (or one 2.5-inch drive and two 3.5-inch drives). Additional watercooling gear can also be mounted on the lower section, Lian Li says. The Lian Li PC-T70 with optional T70-1 cover and panel kit retails for $190 and should be available at shops like Newegg very soon.